FDJ’s Yoann Offredo has been suspended for one year by the French Cycling Federation after three anti-doping “whereabouts” errors. News of the mistakes came out in early January. Now the sanction has arrived. Is it harsh? This depends on your viewpoint but we have a rider entering the prime of their career suspended thanks to paperwork problems. As a reminder, pro cyclists have to be available for anti-doping controls all year and away from racing. Riders use a WADA software package called ADAMS to list a one hour slot for every day of the year where they can be found by testers and controlled. Typically they specify an early morning slot, for example 6am-7am because they’re bound to located at home in bed. When riders complain about the 6am test, it is normally their choice to be tested at this hour. But a rider’s location is never that typical. They are on the move every day for stage races. They are filling in their calendar one minute and then readjusting it the next because of injury, whether to themselves or a team mate’s injury means a late call-up to a race. There have been cases of riders showing up at the start of the Tour de France to replace an injured rider not having time to warm up for the prologue such has been their last minute call up. If a rider is told to jump on a plane they might be too busy packing a suitcase and saying goodbye to the family to think about updating ADAMS. But that’s why we talk of professional cycling and just as a rider has to pay constant attention to diet, teams try to drill the importance of Whereabouts into all riders; some even task their agent with the updates… but the athlete is always responsible. For more on the ADAMS system, see the Cyclingtips blog. A no-show can be explained. A delayed flight, the inability to log on, if a rider can explain they weren’t to blame for the no-show then it is not counted against them. The three strikes are spread over 18 months and drop off after this period. These “out of competition” tests are essential because athletes do not simply dope for the race day but instead can take banned substances to boost their training, recover faster from injury or accelerate weight loss, all whilst away from competition. Offredo seems to have been done for bungling incompetence instead of sinister cheating. Two of the mistakes are simply because an athlete must fill in the system once every four months with their expected location and Offredo was late in doing this. So wrote Ian Fleming in one of the James Bond novels. An athlete is notified of the no-show or admin mistake, they might be casual about the first or even the second one but the third one puts their career, earnings and reputation in peril so to make three errors is almost asking for a suspension. If this sounds harsh, let’s imagine an athlete determined who is determined to dope, they could deliberately duck tests whilst on a programme of banned substances, indeed this was part of the plan used by athletes under the supervision of the Balco lab’s Victor Conte. As a consequence the three strikes rule seems reasonable to me in order to have an effective system. 10.3.3 For violations of Article 2.4 (Whereabouts Filing Failures and/or Missed Tests), the period of Ineligibility shall be at a minimum one (1) year and at a maximum two (2) years based on the Athlete’s degree of fault. One of the no-shows was apparently because his team promised to handle the admin but apparently messed up. If so he might be suspended from racing but his team probably won’t sack him. The other mistakes seem to be down to forgetting to use the system entirely. Many in France see Offredo has an outspoken rider on the subject of anti-doping and so the surprise of seeing him banned is pronounced. Few think he was up to no good but I notice each nation can be more generous with the benefit of doubt when one of their own riders is involved. I’ve watched Offredo for two years now and am saddened to see him out, he’s a talented rider for the cobbles and a valuable help for sprinting talent like Arnaud Demarre and Yauhueni Hutarovich. But this is an exemplary and model case. Three no shows have brought about a ban, exactly as the rules stipulate and he’s copped the minimum sanction. Both rider and team seem to be at fault here although if the team has screwed up the rules stipulate he carries the ban. If many are saddened by the suspension, this is all preventable with professional admin. He can appeal but I don’t see the grounds for this. Looking ahead, it’ll be interesting to see the reactions to the news and whether people view this as an innocent rider being punished whilst others get lighter treatment. 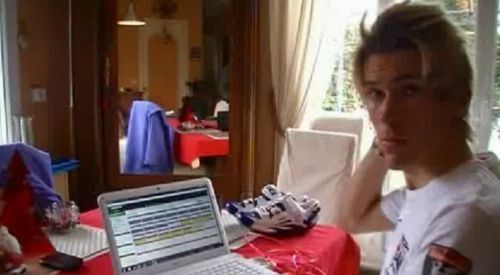 Certainly the case of track cyclist Baugé leaves me asking many questions. It’s tragic that three admin errors mean a rider entering the prime of their career is suspended for a year, more so when the team involved has gone to great lengths to support clean cycling. Worse, they get the dopage treatment in the media, tarred with negative news even though there’s no positive test. But this is the duty of a pro and the team. As well as training and racing, there’s watching the diet and even keeping your bike clean. And there’s an obligation to log on to ADAMS. Offredo’s case seems a sad one but it’s exactly what the rules specify. And unlike other cases, this time the rules seem to be applied to their letter. I like Offredo’s riding, though I always thought his head was a bit off in the clouds. I’ve also serious doubts about the whole whereabouts system, because I’m not sure it’s not at odds with some basic elements of human dignity. How I wish the riders could manage their sport autonomously. But wasn’t Rasmussen cleared for also missing 3 tests? Because I think it’s a little strange you clear one rider, and punish the other.. Bundle: there’s a case in Belgium now led by a high profile lawyer trying to overturn the Whereabouts system on the basis of human rights law. The case is debatable but the verdict could be significant. Golden: Rasmussen missed three but the UCI did not file its paperwork in time. Under the rules if the rider isn’t told within 14 days of the no-show, it is supposed to be dropped and forgotten. The full explanation is here http://inrng.com/2011/09/rules-rasmussen/ but note if he was cleared the UCI are taking his case to the Court of Arbitration for Sport. It’s the very opposite of Pro to forget to use the ADAMS system entirely. WADA has no choice but to sanction, as other riders could ‘forget’ to test while doing some intensive training. If a French team is so haphazard in this respect, is it unfair to conclude that this approach is being applied to other areas of training and race preparation? Maybe another reason why the French don’t win races. The whereabouts system may not be perfect or even good but it’s the system every professional rider should manage to deal with. Frankly, I’m amazed every time a rider gets suspended because of these 3 strikes. I’m sure it’s annoying and sometimes even difficult to comply with but it’s one of those things that you just have to do. Have to agree with most of the comments here. I mean, what exactly do these fellows DO for a living as PROS? Train, travel, eat, sleep, race. Someone else washes the bikes and clothing, drives the bus, flies the plane, runs the hotels, makes the arrangements, etc. Compare it to the days when an independent racer in the Giro had to do ALL of the above himself, or at least find/hire someone to do it for him at the end of each day’s stage, in addition to the 3-400 kms of actual racing. While the racing itself is far from easy, nowadays I think real pros have it pretty easy in comparison when they climb off the bike, so the excuses for missing three tests are hard to believe as long as they’re getting timely (and we know that’s not always been the case in the past) notification of the first two tests they miss. The third one is sporting suicide and the “ooops, I forgot” or “dog ate my homework” type of excuse should be grounds for ejection from the team for nonprofessional behavior in addition to the sanctions. Perhaps the TEAMS should face a penalty too, maybe that would improve compliance? I can imagine it’s pretty onerous and invasive for the riders but, as seems to be the general consensus, even amongst the pros, it’s a necessary inconvenience and it achieves its objectives. Personally if I were to get a 1st strike I’d immediately be extra vigilant to prevent getting to a 2nd strike sword-of-Damocles-hanging-over-you scenario. Given the amount of riders being tested it would seem that the vast majority of them complete it accurately as only the odd few per year fall foul of the 3 strikes. Inrng, sorry but you seem biased because well, you seem to like the guy, you are mushy almost on the topic. Outspoken about doping? What the hell does that mean? What 21st century pro is not ‘outspoken’ about doping? Maybe some of them get carried away because they have more charm in a ring of journalist or have need to be liked that bit more, whatever. Really is this how we the fans are to keep a serious eye on things? How do we know these are ‘administrative’ errors? Because Martial Gayant says so? “He screams injustice and he is right, I support it. It is a settlement but it must be the same for everyone. He is disgusted, dejected, in tears and full of pain.” How frigging dramatic! or is it just the Google translator agian? Today in my local news staff at a nearby hospital were busted for supplying local cyclists with dope, yes, today and right down the road from me. Doctors, nurses, janitors, mothers and sons, epic, well planned, exciting covert stuff. There are plenty of these kind of stories regionally every year between Spain, Belgium, Italy, Germany and beyond. Blog on that for a week and you will have a different perspective on pro cycling. I personally don’t care so much about what the pro’s do, because quite frankly I don’t see how it matters when this sh.t is happening now, right next door for zero currency, zero fame. All for the proverbial pig’s leg, once translated, once understood. However for the love of passion, if we do we want clean pro cycling we could apply a little more common sense. For starters; less PC and lets ask again and again for a hands up in current management (and ownership) on who has taken drugs in the past and made money/got rich doing it. They run through the stats and then ask them if they are seriously telling current pro’s ‘don’t do it because it’s cheating, it’s wrong and say so on Twitter, once a week’. Modern doping in cycling is a very advanced virus that mutates with every shot of vaccine, and come out in a rash every decade or so; 98, 06, ….? Look at Valverde, back and busting out the wins! Sorry, but his doc is a evil genius! He might even be the one down the road. Rider Council: true, the bigger cheats escape problems whilst some get busted for admin problems. I’ve been following him but if I didn’t express it right above, I’ll repeat my idea that his ban is fair, certainly in line with the rules. But let’s note two mistakes were because he missed deadlines to fill upcoming locations. This is more admin than missing a test, which happened once when his team said they’d update the location and failed. So it’s a punishment for sloppy administration. He and his team have tested positive for idiocy. I hate to say this, but the FFC’s action smells like what the RFEC, CONI, et al. have tended to do: protect their big names, enforce only against smaller names. To FFC, Baugé is a possible Olympic gold medalist, while Offredo is still only a “promising youngster”. To CONI, Basso was a grand tour winner while Ricco is a troublesome wonderboy. Is it a wonder that CONI was the one relishing in investigating Valverde, a Spaniard. To RFEC, Contador is a super-star as is Valverde, while Mosquera is a one-time lucky boy who is now luckless. Finally, to the UCI Armstrong is a super-star while Pelizzotti doesn’t exactly bring in a lot of revenue. In this age and with the resources available – it seems plain stupid that ANY professional rider is not utilizing a virtual personal assistance service. For example, http://www.getfriday.com will charge USD 120, or EUR 90 per month for 10 monthly hours to do ANY clerical work (such as updating ADAMS). Assuming that each change in the ADAMS system takes 20 mins, that means that the above mentioned price covers 30 changes of whereabouts – or 1 per day!! Now let’s do the math. 18 months times USD 120 is USD 2,160 or EUR 1,620 for the personal assistant service. Since the UCI MINIMUM wage level for Pro-Continental status is EUR 32,300/year or approx. USD 24,850. Paying for this kind of service means “spending” 3.5% of the yearly salary for a rider (assuming that they only make the minimum pro-conti wage, could be less). I reckon that its a very cheap premium for insuring more than EUR 30,000 on a yearly basis against’s one’s idiocity!!! Ok your angle is this was is sloppy admin and conclude with those are the rules which have to be applied. But missing a deadline, could that not also be a stalling tactic, a risk take? Twice? Then a third time, something else? That’s is really bad secretarial work indeed. Question is ,was he aware he was going to miss the deadline, 3 times? The assumption seems to be no, no and no. If you ask me 3 is a lot in light of the mess another pro rider got himself into recently. If spot checks are the most effective way of catching doping then avoiding them is probably the best tactic not to get caught, no? I don’t fancy gettting involved in the debate that is going to rumble on…So i’l just put my French hat on an say, this is a shame. He would have been a good outside bet for a classic. I would have put more money on him winning than Van Summeren or Nuyens. Rider Council: any athlete on the scheme must los in at least once every quarter and fill in their location for each quarter. For example, you can log in now and fill in Q2 2012, which April-May-June. If you know your race program you can put this in or you might just fill in your home address as the default for the whole three months. Either way, you have to log in and inform the system before Q1/Q2/Q3/Q4 begins. Offredo failed to do the quarterly registration, for example he didn’t do his Q1 2011 status before 31 December 2010. For now, that is all we know. But imagine he wanted to dope and so needed to avoid tests, better to take the banned substance and hide behind the door when the inspectors come knocking rather than getting two no shows simply because you failed to log in to the system in time, that is using up the doper’s “lives” for no practical gain. @ Rider Council totally agree that this should never happen (see my comment above) but if someone were trying to avoid testing a better strategy would be to fill in your whereabouts incorrectly rather than not submit them at all. That way you would have the uncertainty of a visit from the testers where you weren’t x 3 rather than the certainty of failing to submit by the deadline x 3. For my piece, Offredo says for one of his missed tests he was at a race. I wonder if he was tested there and what the outcome was (or if this is the same missed test due to team admin issues). His missing three Whereabouts tests also doesn’t seem out of line with the image that I have of him from a number of his comments over the years. To be clear, I’ve never met him or anybody who knows him, so this is pure speculation, but his quotes do give him a bit of the day dreamer, not-quite-organized aura. I’ve known plenty of these people outside of bike racing who screw up in similar ways to Offredo simply because they are disorganized, flighty personalities. It is thoroughly ridiculous that he bungled two tests; I only wish the places I worked would give people a one year ban for being unprofessional three times. Sorry – these guys have so little in terms of personal responsibility. They are paid to train….race…and….ensure they comply with WADA code. That is all they are asked to do. If this were SO difficult, there would more of these situations. The UCI need to buck their ideas up. Here we have one rider with a year-long ban because they did what they are supposed to do and inform the rider of his whereabouts violations, while another gets off scott-free because of the UCI’s incompetence. Along with all the different variations in bans and fines etc. that we seem to see, there’s quite a lot that needs to be sorted out with the whole system of punishment in this sport. And photographers everywhere breathe a sigh of relief. It went without saying… but I’ll say it that every other rider copes with the system, we only hear of the rare cases where people mess up three times in a row. Agree with comments that a pro’s life is not that complex! Not since with working 38-40 hrs per week (average), married with 4 kids (3 teen girls! ), plus racing March – September, plus a ton of other stuff, yet manage to keep it all organised…sort of, definitely anything legal/contractual! Anyway, the dude is educated in an apparently 1st world country! You have to remember, the little personal responsibility riders have make them more likely to fall over when some comes their way. Millar recounted the difficulties he had in ‘normal’ life when he was banned – most riders in the peloton would have trouble crossing the road without a DS! This seems to me a topic perhaps this blog could cover. What exactly is expected of these riders, how are they treated when on the team (are, as Peter claims, man-children, all incapable of dealing with anything outside of the vacuum of their existence as a pro?). I try to look at both sides of the coin, and this is an instance where perhaps I am not being sympathetic enough as to how little these guys know of the real world, and how little these guys (and girls) can actually handle the day-to-day tasks expected of anyone north of 18. Offredo, Bauge, French Doping Agency ,Olympics. Discuss…. Have now read the comments, i can see i echo the sentiments of Julius. I went to the London velodrome last Friday, and i have to say I was not happy to see Bauge there…. i’m glad to see that the riders association is taking a stance on this, especially due to the fact that one of the missed tests was due to the fact he was at another UCI sanctioned event (and therefore available for testing on that particular day), which i think is pretty fair mitigation for getting it wrong on the whereabouts. i’d also like to say that i’m v happy to read about kolobnev. here is a rider that in my opinion did everything right post positive – sat himself out, didn’t kick and scream to the media, didn’t put together a big legal team, didn’t react to unfounded smears during this period, and just let due process take its course – for all which i think he should be applauded. he won’t be of course, as he will be viewed to many as tarnished now. this is a truth that is a real shame about human nature. overall, i have to say that bauge aside, i think there has been more or less “fair” outcomes for doping/whereabouts indiscretions over the last two years….